To construct a proper financial plan for your clients, as a successful financial advisor, you must have a thorough understanding of their household’s income and expenses. If your clients have a budget, ask for a copy, so you can review it prior to your next meeting. If they don’t have a budget, one of your first tasks is to guide them through the budgeting process. Introducing your clients to budgeting and making it easier for them is a great way to deliver big value to them. If clients are reluctant to budget, for whatever reason, point out that they’ll have more money to spend on what they enjoy and value most if they curb spending on items they have nothing to show for. Budgeting provides the visibility needed to make great spending decisions. The first step in creating a budget is to get a relatively accurate estimate of the household’s net income (after taxes). If a household member is a paid employee and receives a W-2 at the end of the year, your job is easy —you can calculate the person’s monthly income based on the two or four paychecks per month. Estimating net income for a household member who owns a business or is self-employed is more complicated. This person probably receives payments from numerous clients, receives a nontraditional W-2 or a 1099 from each of them, and pays estimated quarterly income taxes. In addition, you need to subtract business expenses, such as mileage, meals, travel, phone, and other expenses, which may be tightly woven into the household expenses, making them difficult to discern. When you’re dealing with households that have business or self-employment income, you may be better off not trying to estimate the household income and instead focus on expenses, as explained next. If the household members are racking up a lot of debt, you can tell that they’re living beyond their means and need to rein in their expenses or create other sources of income (or both). Clients often earn considerable income and wonder where all that money goes. When they take the time to list their monthly, annual, and semiannual expenses, they quickly see exactly where that money goes and can begin to identify expenses they can and can’t trim back. 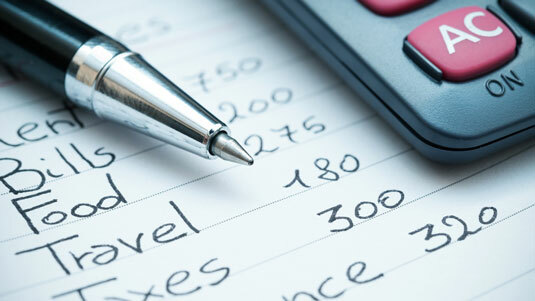 To construct a financial plan for your clients, you must be able to estimate their household expenses. A reluctance to budget can often be traced to how complicated the process is and the number of expense categories that must be tracked. Here, the expense categories are whittled down to eight, so you can simplify budget management for your clients. If a major life change makes your client’s current housing unaffordable, don’t hesitate to discuss the situation. For example, clients often retire in the home they lived in during their working years only to discover that the home is far beyond their needs. You’ll be surprised at how many clients nearing retirement age are already thinking of downsizing into a smaller home, condo, or an assisted living community (if they’re more advanced in age). Depending on where your clients live and their travel needs, a car (or a second car) may be a necessity or a luxury, and it’s often a major expense. In Los Angeles, where I live, the cost of transportation is often a big expense for many households, especially if the commute is long and gas prices are high. Utilities include gas, electricity, water/sewer, trash/recycling, phone, TV, Internet access, and security systems. Ask your client to gather the monthly utility bills, total them for the year, and divide by 12 to determine the monthly average. Beware: Using bills for this exercise during peak cost seasons, like winter for natural gas, will make for a high annualized estimate. Consumer debt includes credit card balances, student loans, and other installment payment programs other than secured loans, such as mortgages and car loans. Most clients have some consumer debt. Carrying month-to-month consumer debt means the household is consuming more than the income is able to support. Something’s got to give. Work with your clients to address any deficit spending proactively. Otherwise, you and your clients may be dealing with the issue reactively later when fewer options are available. This category includes groceries and food-delivery services for dining in. It excludes dining out, which is in the entertainment category. I’m always surprised by the costs associated with this category. I mean, who knew personal care and clothing could cost so much? Personally, I spend very little on haircare, because I’m bald, but others in my household treasure their locks and don’t hesitate to spend money to maintain their hair’s luster. Some of my clients are very good at slashing expenses in this category by focusing on clothing — never spending full retail; they wait for sales or shop at outlets. Most people struggle with this category. After all, people want to enjoy life. To chide some clients for overspending on luxuries would be akin to asking them to become homeless. Would-be clients who engage in conspicuous consumption are the most challenging to manage toward a favorable financial outcome. As your clients get their spending under control, they should be able to free up some cash to place in savings as a buffer to protect against unexpected financial setbacks and to start building wealth. Give your clients this age-old advice: Pay yourself first! Right off the top, they should stick about 10 percent of their income into savings, which should quickly fund an emergency fund, and then allow further progress toward funding a retirement account, college savings account, and/or other savings vehicles. Advise clients to build and maintain an emergency fund to cover any events that disrupt income, such as job loss or temporary disability. They should set aside the equivalent of 3 to 12 months of basic household expenses (excluding discretionary spending). If your client is an established senior manager with significant benefits at a stable company, three months may be more than adequate. On the other hand, clients who participate in the gig economy should place enough money in a savings account to cover 12 months. Don’t start your clients with an investment plan until they have 3 to 12 months of bank savings. Otherwise, your clients may find themselves having to sell investments when the market is down. Nobody knows what the market value of an asset will be if and when a client needs to sell it. These targets are starting points. Every household’s expenses and spending priorities differ. Work with your clients to tweak the percentages to align them more closely with their preferences, but be sure the total doesn’t exceed 100 percent of net income.